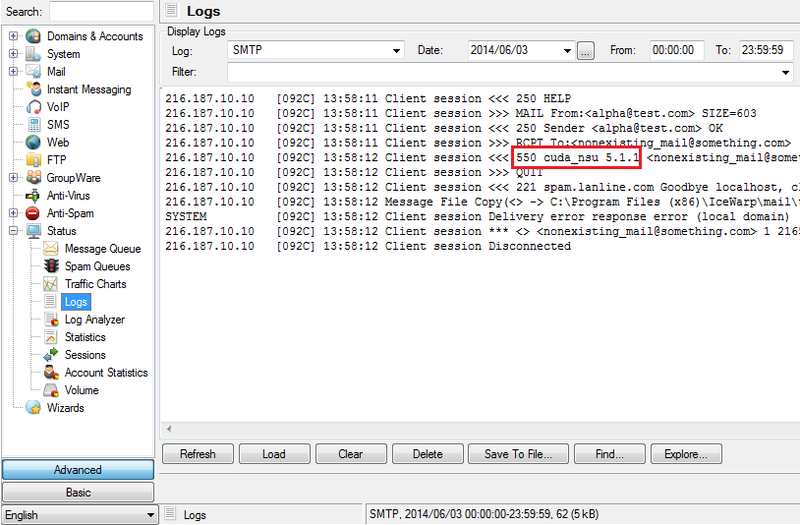 SMTP delivery errors can occur in SMTP session log. You can find them by checking the Logs tab from the Main Menu > Status tab > Logs. Category "5" indicates that a message was not delivered. The table below lists the most common SMTP errors with a short description to help you understand their cause, and provides brief remedy instructions. Consult further documentation before you modify any security settings. The SMTP command currently used was unrecognized or is not supported by the SMTP service. Review the syntax of the last command and try again. Another possibility is that you are trying to use telnet and the telnet connection to your server is not allowed. Check the settings in administration console:Mail service -> Security -> Advanced. Sender has no domain specified (usually in MAIL FROM). Specify the senders' domain name and try again. The problem will be with user's e-mail client, not your server. The e-mail client configuration is probably not supplied with a domain name. SMTP session syntax invalid (usually unbalanced brackets). Check the syntax of the last command and the configuration of corresponding .dat files. Common syntax error. You probably mis-typed last command or last string is invalid. Check the syntax of the last command. Usually when there was blank or invalid string sequence after HELO/EHLO command. Retry the SMTP greeting with correct HELO/ELHO command. The process of authentication was canceled for any reason. Restart the authentication process by using proper command. The username/password combination provided during authentication was invalid. Reenter both the username and the password and authenticate again. 1) Disable this – check in administration console: Mail – Security – Advanced – Reject if SMTP AUTH different from sender. 2) Local senders has to use submission port or disable this setting using the C_Mail_SMTP_Delivery_MessageSubmission API variable. You can allow/disable particular operations and commands from the administration console:Mail Service - > Security -> Advanced. A supported command was used in invalid order. For example command RCPT TO used before MAIL FROM or DATA command used when RCPT TO command was not accepted. Solution depends on the context in which this error occurred. Check the last few commands sequence. Greeting error. HELO/EHLO command is required by the server. You have to use HELO or EHLO command. You can deactivate this option in administration console, or create a Bypass: Mail Service - > Security -> Advanced. Invalid authentication type. Incorrect or none type of AUTH specified. Use the command AUTH with proper authentication type. Authentication with command AUTH is required. Use AUTH command (SMTP Server requires authentication) or disable this authentication type in administraton console. Server is not open for relay. Check the account limits for the particular user account, its domain and on the server level. The user who gets this error is allowed to send mail only to local domains. Disable this option in the administration console:Management -> [User] -> Options -> User can send mail to local domains only. 2) Reject if originator's domain is local and not authorized option turned on. 1) Review server black list filter settings or set a bypass file. 2) Local users have to authorize themselves so if they do not have this set up in their e-mail clients and you turned this on they are not allowed to send. 2) Server blocked access from the originating server by HELO/EHLO Filter. 1) Review server black list filters and user rules or set a bypass item. 2) Whitelist the originating server in HELO/EHLO filter, or remove it from blacklist, or create a Bypass. Unknown user account. The recipient is not local, thus reject the message. Behavior and the treatment of messages coming to unknown user accounts can be set from administration console: Management > [Domain] > Unknown Account. User account is not local. Mailing list is not local. The number of recipients exceeds the maximum of allowed recipients. Older versions of Merak Mail Server used to follow RFC and had maximum of recipients set to 100. If you need more recipients or use mailing lists, upgrade to the latest version (adds support for unlimited number of recipients). Too many data was sent by the user. User account has an amount limitation. You can increase or disable amount limit from administration console - user account management - Limits tab. Make sure all 3 levels (server, domain and user) are set to 0 (stands for unlimited). Virus was found in the message body or in the message attachment. If you think the attachment is not harmless (false positive), try to alter the configuration of the anti-virus engine (Quarantine instead of Reject), or create a Bypass entry. Content filter applied and the message was rejected. Review the content filter settings in administration console. If you think this message is spam (false positive), try to alter the configuration of the anti-spam engine, index the message by Bayesian or create a blacklist entry. If you think this message is not spam (false positive), try to alter the configuration of the anti-spam engine, index the message by Bayesian or create a whitelist entry. Click the Bypass button in intrusion prevention settings (smtp specific rules) to specify an IP address (or a range of IP addresses) where this limit is not applied. Or increase the value of c_mail_smtp_general_parallelipconnectionslimit variable. Zero means no limit. Alter your content filters configuration. If you do not want to use Challenge Response, you can deactivate it in your anti-spam settings (Trust tab in older versions, now Quarantine node). Review settings of Limits on server / domain / user level.